1. Let fish reach room temperature, pat dry with a paper towel and season. 2. Heat oil in a non-stick pan on high, dust fish with flour and fry skin-side-down. Press fish down with spatula for 5 minutes before flipping, to achieve an even crisp. 1. Melt butter in pan, remove from heat and add rest of ingredients. 1. Preheat the oven to 180°C. Line a baking sheet. 2. Toss butternut chips in a bowl with olive oil and salt, thoroughly coat. 3. Arrange in a single layer on baking sheet, and bake for 40 minutes until crispy and tender, turning once while cooking. Remove from the oven and set aside for serving. 4. 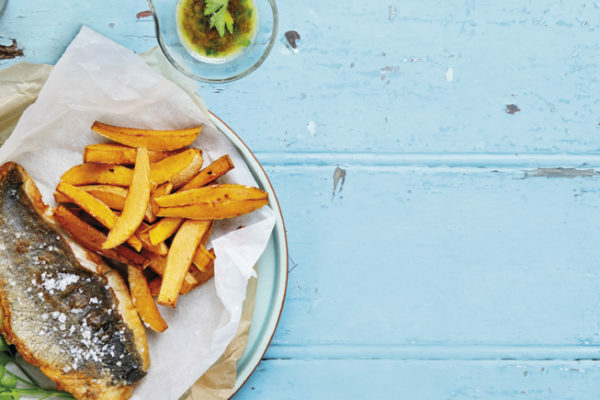 Serve the fish with the butternut chips and olive butter sauce. 1. Soak the calamari in buttermilk for 30 minutes, or overnight if you can. 2. In a bowl, combine all the ingredients for the seasoned flour. 3. In a separate bowl, combine all the ingredients for the harissa dipping sauce. Set aside. 4. In a pan, heat the oil to a medium heat. 5. Dredge calamari in the seasoned flour, coating evenly. 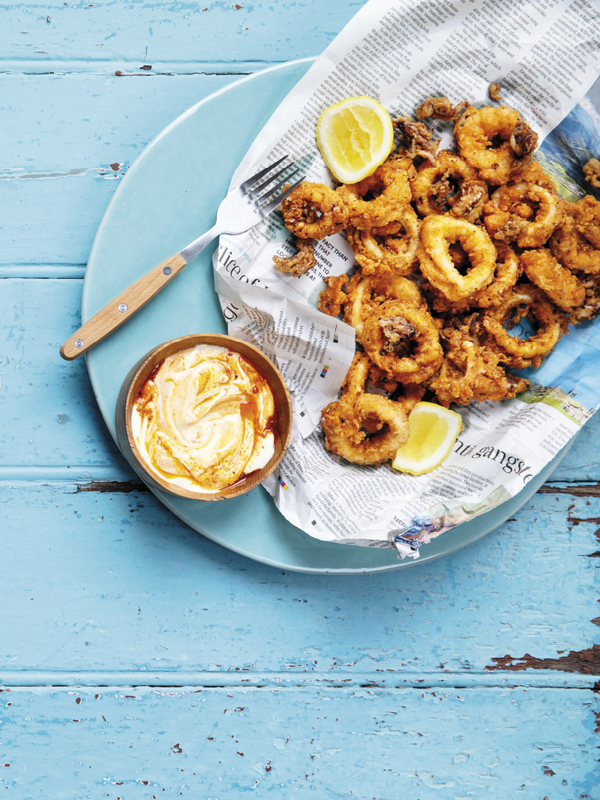 Carefully fry calamari in batches. Cook until golden brown. Remove with a slotted spoon and transfer to a paper-lined baking sheet. Season lightly. 6. Serve with sauce, parsley and lemon. 1. Portion the fish into 6 pieces, lightly season and refrigerate for at least 30 minutes. 2. Mix all the dry ingredients for the battered fish together. Slowly add beer, and whisk until just combined and smooth. Keep cool. 3. In a large frying pan, heat the oil on a medium to high heat. 4. Working in batches, dip the fish portions into the batter. Allow the excess batter to drip off, and lower gently into the oil. Fry until light golden brown, about 4 minutes on each side. 5. Combine the mayonnaise, herbs, lemon zest, juice, finely chopped chilli and season. 6. 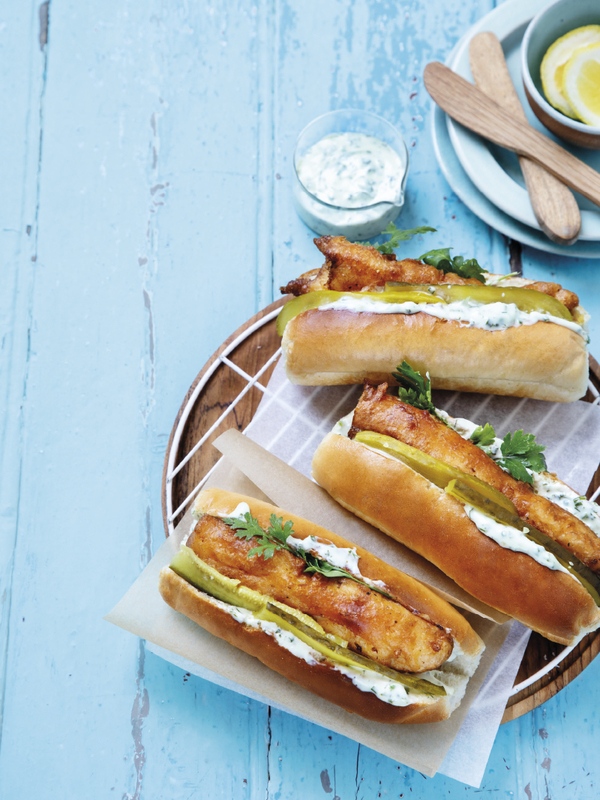 To assemble, dollop and spread some herb mayonnaise inside each roll, add a piece of fish and top with pickles and some parsley. 1. Mix together the olive oil, paprika, and lime zest and juice. 2. Brush the prawns with the paprika oil and reserve some for cooking. Refrigerate the prawns for 30 minutes. 4. Heat a griddle pan on high. 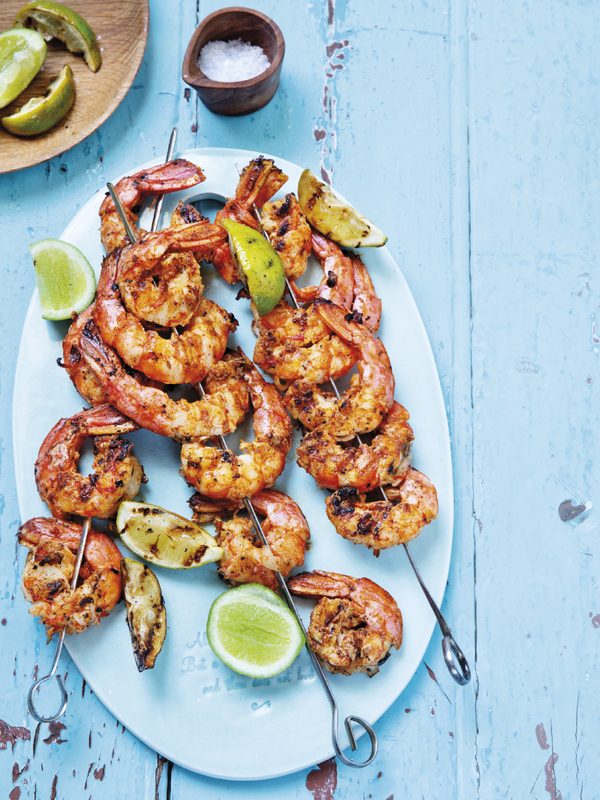 Grill the prawns for 3 minutes on each side, basting with the remaining paprika oil, until cooked through. 5. Serve with charred lime wedges. This blend combines the freshness of Sauvignon Blanc with unwooded Chardonnay for a perfectly balanced and flexible vino. If you’re looking for something crisp to offset a rich, greasy dish such as battered hake, this is the ideal pairing. South African Chenin Blanc is incredibly versatile, incorporating both fruity and gently acidic flavour notes. It pairs especially well with foods that have a sweet and sour element, such as a soft fresh linefish with a more acidic sauce. Prosecco enhances the subtle flavour of shellfish. A sparkling wine that is too sweet will often end up ruining the flavour of the seafood, so something fresh, effervescent and dry will pair beautifully with this flavour profile.